Using a non-skid backing and weight from its thick construction, which includes a high grade Fiberglass sheet for stability; it stays firmly in place! It has a strong durable ceramic coating and is quiet and warm under foot. ELEVATIONS unique design allows the planks and tiles to be installed over all types of subfloors including natural wood, concrete, one layer of existing vinyl, ceramic and uneven subfloors. Subfloor preparation instructions on the following pages must be followed. 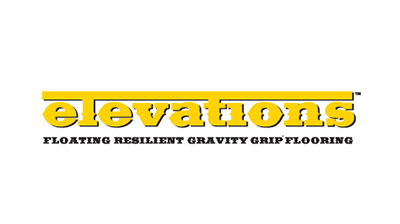 ELEVATIONS is water resistant so it can be installed in moisture prone areas where wood flooring and laminate products would not be used. Three key attributes make Elevations superior to competing floating LVT products.